After leaving Kilkenny around 10:30, and then making a few stops along the way, we finally arrived to Connor Pass, the scenic "short cut" from the north side of of the Dingle Peninsula to the south side of the peninsula, around 3:30pm. I had read that Connor Pass was a must do if planning a visit to Dingle, but also that it was a frightening drive. Signs were posted making it very clear to any driver that it was going to be a narrow path. It was definitely more narrow than other roads, so buses and trucks wouldn't have been able to fit with on coming traffic, and there were more blind spots than elsewhere, and if a car was coming at you, one of you had to pull to the side for a few seconds. But since Luke and I spent 8 months driving roads like this in Scotland, we managed just fine. Along the way across the peninsula, there were a few pull over look out points. As this was a road trip, we pulled over as much as we could! We had a wonderful view of the mountains and small lakes ahead. We climbed and climbed until we were blocked by a fence. We could have hopped the fence if we wanted, but it was good we had a reason to stop. Luke always wants to be at the highest and most secluded spot there is. From there, we only had a short drive until we reached Dingle Town. We could see the town as we headed back down Connor Pass toward the southern coast of the peninsula. We finally reached Dingle at 5:15pm, not realizing we had spent that much time exploring during our stop along the drive. We dropped our bags at our AirBnB (where we had a MUCH better host than in Kilkenny), and then immediately headed out to explore the town. 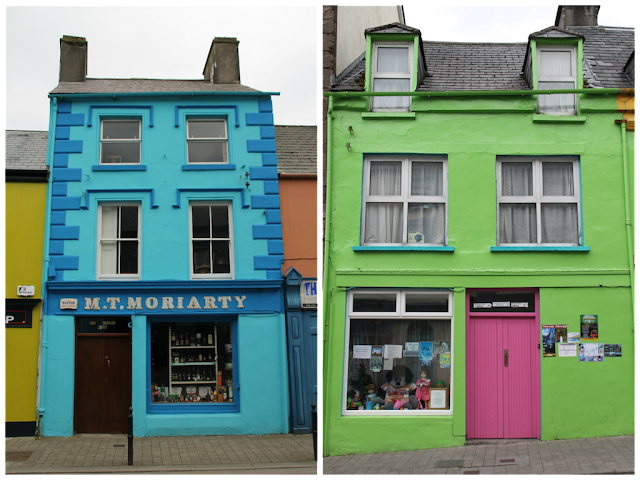 I loved all of the colorful buildings sprinkled throughout Dingle. There were lots of different pubs for us to visit. The town was very quiet, but I am thinking it is much busier during the day. Down at the harbor, we watched kayakers coming in and going out. We also kept our eyes open for Fungi, the dolphin who lives in the harbor, but we did not see him. Then we had to decide where was best to eat dinner. Every place looked so good, and we knew the seafood was going to amazing wherever we went so it was a tough choice. We ended up at Out of the Blue, a restaurant that serves only freshly caught that day fish, where Luke was able to eat Oysters which he never gets to eats outside of Louisiana. We made our way back to the apartment after dinner, so I could start washing some clothes. We had a VERY VERY long day on Friday, as we drove the Ring of Kerry (coming in another post), so we needed to rest up for that. 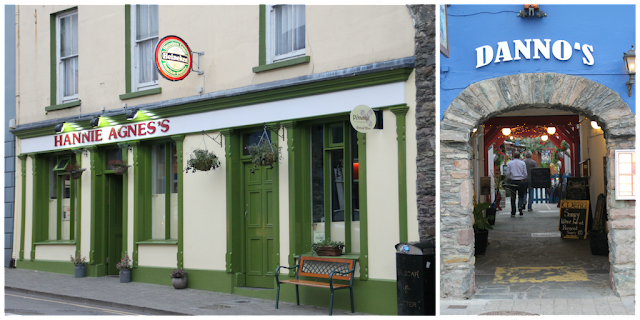 For our second night in Dingle, we were pretty exhausted from the long day, so we took it easy, and for dinner we chose to eat at Doyle's, which was more expensive than we would have liked, but at least it was really really good. On Saturday, we spent a few hours driving the loop on the Dingle Peninsula, called Slea Head (coming in another post), where we had amazing weather... again! 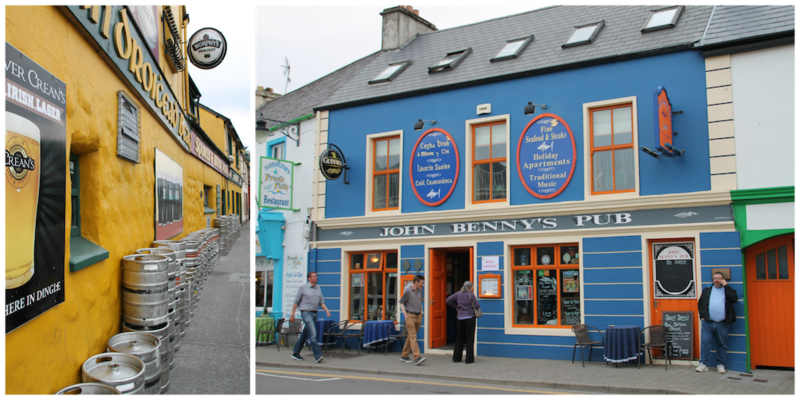 We looped back around to Dingle to have one last bowl of Seafood Chowder to wrap up our time in Ireland before heading to the Kerry Airport to fly back to London. What an AMAZING week! Ireland spoiled us rotten for beautiful coastal views and beautiful coastal weather. I'm not sure any coastal road trip can be it! Dingle is the English name for the town, while the Irish name is An Daingean. Some road signs display only the Irish name which can make it confusing to find the town if you are relying on the signs for navigation.